edit: Continuation of the map from the previous forum. Suggestion: Post formatting to keep things nice and tidy. Last edited by ContriveDallasite on 08 Feb 2017 16:48, edited 7 times in total. edit to clarify - I can't take credit for this. Someone asked for the link and I had it bookmarked because it's awesome. This is awesome! Thanks to whoever compiled it! Amazing how much is going on. Glad this is still going. Here's an in-depth map of Fort Worth as well. This map needs an update. It does not include the North Grove development, which is the largest planned development south of Dallas and Fort Worth, in Waxahachie. There is also the 35 expansion in Waxahachie which is turning 35 into a modern urban style corridor in Waxahachie and making it a 6 lane as far south as Hillsboro. Both projects are in the process of construction, btw. joshua.dodd wrote: This map needs an update. It does not include the North Grove development, which is the largest planned development south of Dallas and Fort Worth, in Waxahachie. There is also the 35 expansion in Waxahachie which is turning 35 into a modern urban style corridor in Waxahachie and making it a 6 lane as far south as Hillsboro. Both projects are in the process of construction, btw. Is Waxahachie even part of DFW?.. surely it doesn't belong in the Urban Development thread. Ex-Urban would be more appropriate in my eye. Waxahachie is closer to Dallas than places like McKinney. While not dense, there is continuous development along I-35E all the way to Waxahachie. I personally know people there that commute into Dallas. Waxahachie IS considered part of DFW. Ellis county is part of DFW. In fact, one of the most vital economic industrial centers to the entire Metroplex is Midlothian, which is both the steel and concrete industrial capitol of Texas. Added this one. Appears to be right across NW Highway from the White Rock Station but haven't seen anything on it. dch526 wrote: Added this one. Appears to be right across NW Highway from the White Rock Station but haven't seen anything on it. I was thinking an assisted living community was coming in here but my quick google search failed me. Thanks for the update. My guess is that they may have mixed them up (589-486=103' height) I've seen it happen a couple of times before on there. Does anyone know what's being built across the Icon on Ross , across from Little Woodrow's? I saw a small building being constructed with huge parking lot facing Ross today. What is this?...I am so disappointed by this..... Not the direction I was hoping this piece of Ross was going. Not related to the development per say, but does anyone know how frequently google maps updates its 3d buildings imagery? It is already about 1 1/2 years out of date. I clicked on this link on a post by Texasstar. It is a handy compilation of renderings of Dallas projects currently under construction. You can click on each rendering for a larger, expandable view. Added THE Alexan to the map, now that construction is nearing an end. invading the forum for free advertisement, i see. touche. For example, the west village hotel project which is still very much under construction is not on there. Is this not the map? I'm able to see it. It appears that someone deleted multiple layers, removing most of the data we had compiled. I will regularly save backups of the map, but we would need together as a forum to recompile most of the sites. For all you Google Maps Nerds, Google has update their aerial imagery, plenty of new construction sites and developments to take a look at. 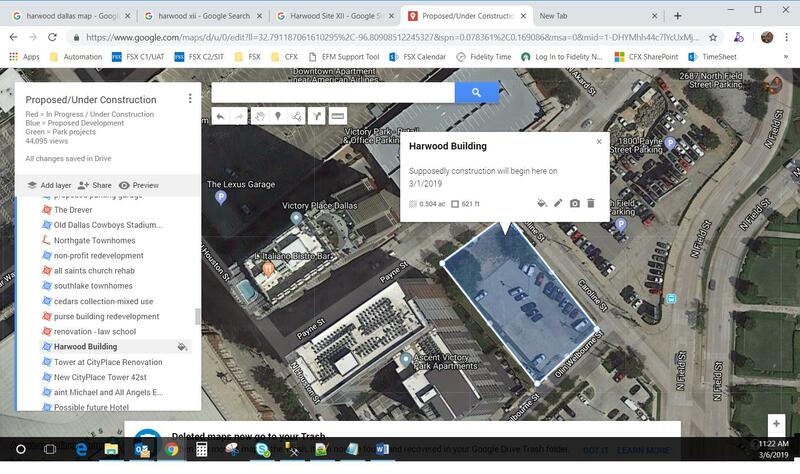 ContriveDallasite wrote: For all you Google Maps Nerds, Google has update their aerial imagery, plenty of new construction sites and developments to take a look at. On Google Maps? I still see the same imagery. None of the new Victory Park towers are built, for example. Google Earth through the browser usually has more updated imagery than the app as well. Downtown block 122, I think it's called, surrounded by Park, Saint Louis, Harwood, and I-30, has been marked as one of Mike Hoque's purchases, but according to DCAD maps and assessment hearings it still appears to be owned in pieces by Sam Harrington and at least one grocery business. Any info on whether we should remove that development marking, or whether it is, in fact, part of the Dallas Smart District project now? This building is wrapping up. It has been interesting watching the building rise only from the viewpoint of a train window, which would be the back-side of the project. 10-story assisted living. Seems like they got carried away filing for 589 feet. Sounds like they used AMSL.